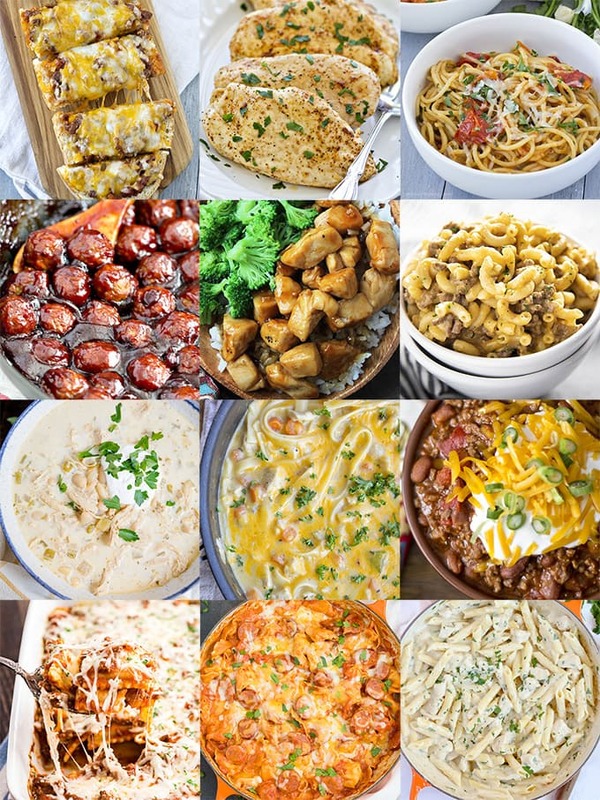 Quick and Easy Dinner Ideas is the name of the game with these delicious recipes. 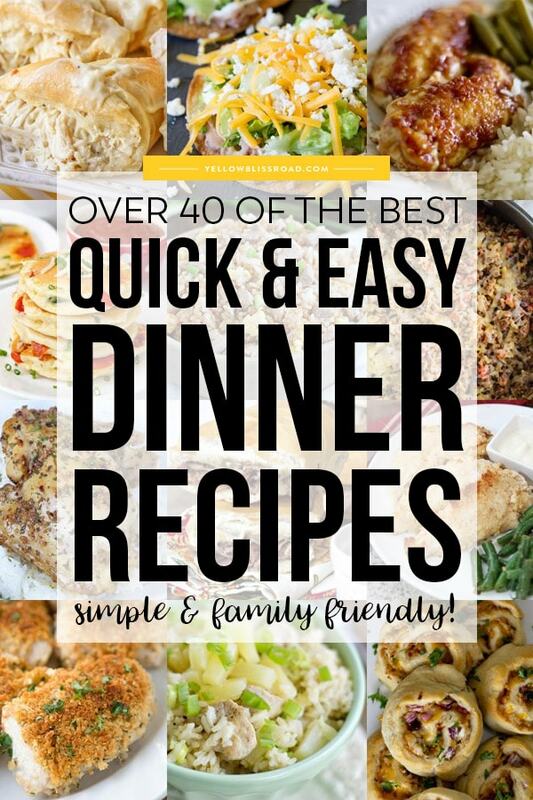 Get dinner on the table fast with these easy dinner recipes for your family. Let’s face it, whether you have a big family or a small one, you have to cook dinner. Each night I look at my kids and think, “They want me to feed them AGAIN? !” I don’t want to spend hours in the kitchen every night. 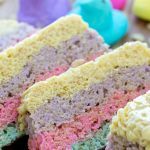 Quick and easy dinner ideas that my kids will actually WANT to eat, are a must have in my cooking arsenal. 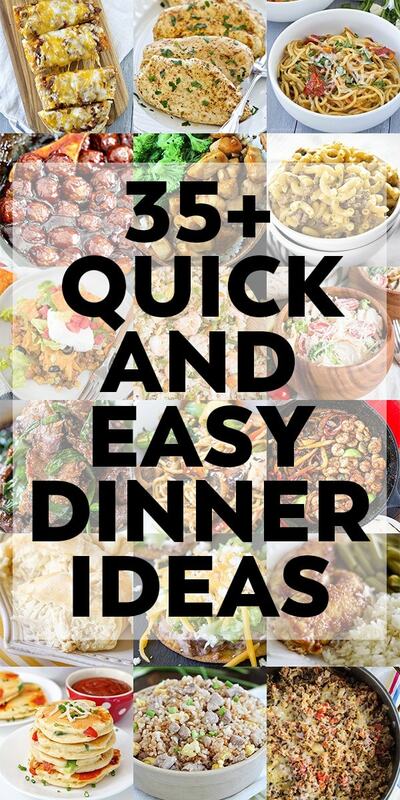 Here I’ve gathered up over 35 delicious dinner recipes. 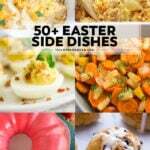 Most of them take 30 minutes or less to prepare (QUICK) and have 10 ingredients or less (EASY)! Did I mention I like easy? Each of these recipes assume that you have things like water, butter, oil, salt and pepper on hand so those staples do not count towards the number of ingredients. 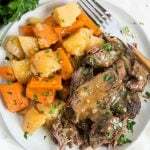 I’ve broken down these easy dinner recipes into three blocks of images and links, but they are in no particular order. 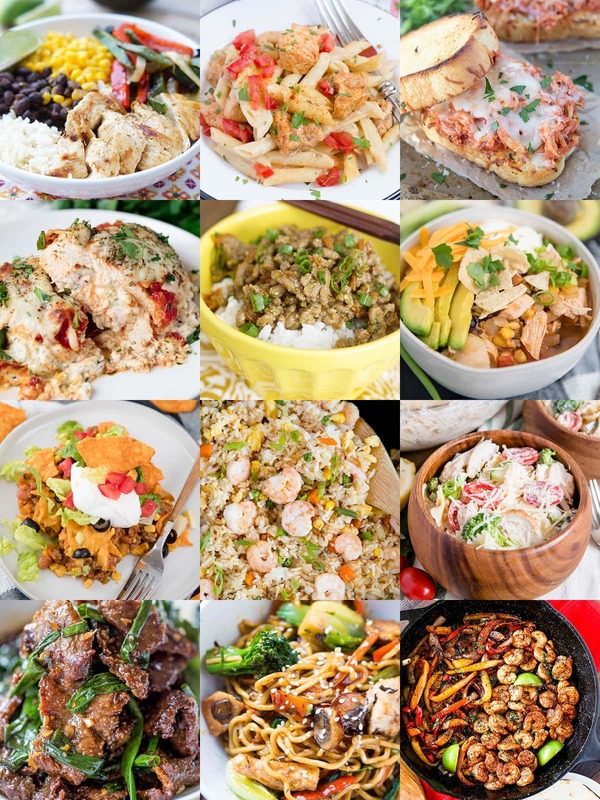 There is a variety of different dishes, styles and techniques, but what they have in common is that I have personally tried nearly ever single one, and can attest that they are simple, quick, delicious and totally family friendly. Healthy Chicken Fajita Bowls with Rice – Healthy chicken dinners are always on my list of wants – this one’s got beans and veggies and is packed with flavor. Creamy Cajun Chicken Pasta – Spicy, cheesy, creamy…this is one chicken pasta dish the whole family will love. Shredded Chicken Parmesan Sandwich – Shredded chicken smothered in a rich tomato sauce and topped with cheese, all sandwiched between crispy crunchy Texas Toast Garlic Bread! Lasagna Stuffed Chicken – all the flavors you love from lasagna stuffed inside a chicken breast and smothered in cheesy, saucy goodness. Ground Turkey Teriyaki Rice Bowl – A healthy recipe that tastes great layered on a bed of steamed rice or wrapped in lettuce cups. Chicken Tortilla Soup – Simple and quick soup with tons of Mexican flavors. Dorito Taco Salad Casserole – Tacos in a casserole, sandwiched between layers of cheesy nacho Doritos. What’s not to love? Shrimp Fried Rice – An easy take-out recipe that’s so simple to make at home. Creamy Chicken and Veggie Pasta Salad – Perfect for busy weeknights and incredibly refreshing for summer. Easy Mongolian Beef – Crispy, sweet strips of beef that are full of garlic and ginger flavors and so much better than take-out! 15 Minute Chicken Stir Fry – Chicken, veggies and noodles in a quick and savory stir fry sauce. Skillet Shrimp Fajitas – Perfect for busy weeknights with colorful seasoned bell peppers, onions, and juicy shrimp cooked quickly in a hot skillet and served in a warm tortilla. Crescent Roll Chicken Bundles – Shredded chicken mixed with cream cheese, Italian dressing mix, and cream Of chicken rolled into buttery crescent dough – a tried and true family favorite! Oven Baked Tostadas – Crispy baked corn tortillas smothered with refried beans, lettuce and cheese. 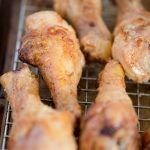 Brown Sugar & Garlic Chicken – Brown Sugar & Garlic adds a subtle sweet and savory flavor to the chicken that is truly unique and so delicious. Pizza Pancakes – Personalize them with your favorite pizza toppings for a delicious family dinner in under 30 minutes! 20 Minute Pork Fried Rice – Super simple and just a few ingredients and so much better than take-out! 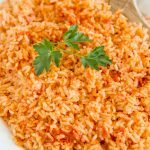 Porcupine Skillet – An easy one dish meal with ground beef, rice and tomatoes. 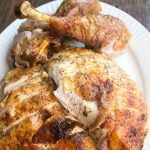 Savory Broiled Garlic Chicken Thighs – Simple flavors brushed onto skinless chicken thighs and broiled to perfection. Easy Baked French Dip Sandwiches – The whole family loves this simple and quick easy dinner idea! 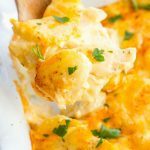 Baked Ranch Chicken – Everyone loves this easy dinner idea – chicken tenders topped with ranch and a quick baking mix coating. Baked Ranch Parmesan Crusted Chicken – Buttery Crackers, savory Ranch and Parmesan Cheese blend together to create the most juicy and delicious chicken you’ve ever tasted. One Pan Pineapple Chicken and Rice – Sweet and savory and all in one pan – this is one amazing dinner recipe! Barbecue Chicken Pizza Pinwheels – Another unique pizza recipe for the win! Barbecue chicken, onions, cilantro and cheese…yummy! Even More Easy Dinner Ideas! Sloppy Joe French Bread Pizza – This is one easy dinner recipe that my family can easily get behind. Sloppy Joes + Pizza?! Yes please! 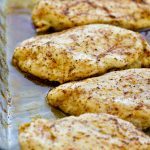 Oven Baked Chicken Breasts – done in just 20 minutes, this recipe puts an end to dry chicken! 10 Minute Garlic tomato Pasta – a quick and easy dinner idea when you really don’t feel like cooking, this simple pasta dish takes just minutes to make and is bursting with flavor. Spicy Cranberry Meatballs – easy to make with pre-cooked, frozen meatballs, or with our easy 15 minute Meatballs recipe, this sweet and spicy recipe is delicious served over a bed or rice with a side of steamed veggies. Easy Chicken Teriyaki – Simple and delicious homemade take-out. One Pot Homemade Hamburger Helper – A homemade version of the classic favorite Cheeseburger Macaroni that we all know and love. Rich and cheesy and tastes so much better than the boxed version! White Chicken Chili Recipe – Super creamy and rich soup full of beans and chicken with a hint of heat. One Pot Creamy Chicken and Noodles – A classic comfort food dish that will take you back to your childhood in under 30 minutes. 3 Ingredient Chili – When you’re short on time, a long list of ingredients can make or break your easy dinner idea…so this 3 Ingredient Chili is a no-brainer! Baked Ravioli Casserole – Get that cooking-all-day, Sunday-supper-style meal in under an hour. This one is a keeper! One Pan Creamy Tortellini and Smoked Sausage – a delicious one pan meal that combines the tender, cheese filled pasta with savory smokey sausage and wraps it all in a creamy cheesy tomato sauce. Creamy Garlic Penne Pasta with Chicken – Serve this creamy pasta dish alongside with a crisp green salad and your easy dinner is served! 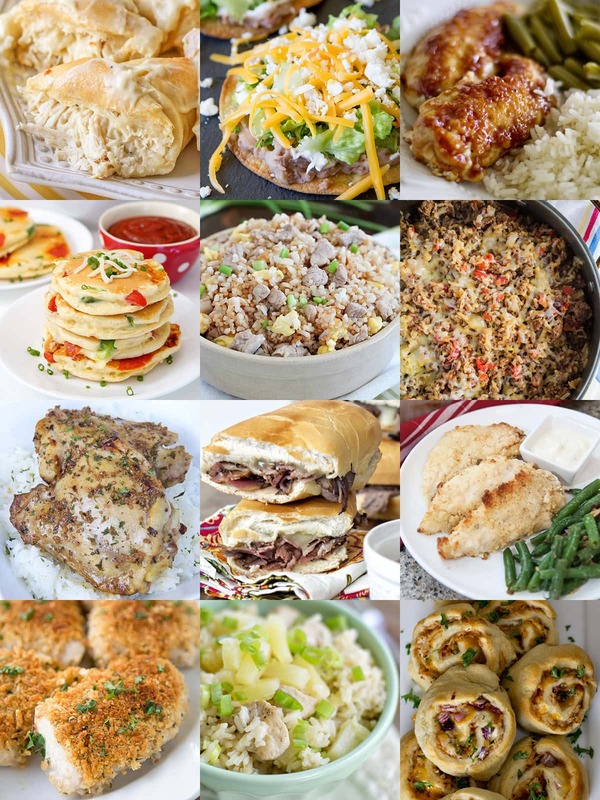 We hope you enjoy these easy weeknight dinners! For even more easy dinner ideas, go HERE. Our quick and easy dinner is usually Stir-Fry! I love it and we always have the ingredients to make it. Thanks for this list! Love this! Thanks for posting. I grabbed a ton of new things that I think my family will love.